Recombinant protein fragment corresponding to a region within amino acids 193 and 545 of Human MMP2 (NP_004521). 293T, A431, H1299, HeLa, HepG2, MOLT4 or Raji cell lysate; U-87 MG whole cell extracts. PC-3, mouse brain. Our Abpromise guarantee covers the use of ab97779 in the following tested applications. Immunofluorescent analysis of methanol-fixed HeLa (Human epithelial cells from cervix adenocarcinoma cell line) labeling MMP2 with ab97779 at 1/200 dilution. Immunohistochemical analysis of Human endometrical carcinoma labeling MMP2 with ab97779 at 1/500 dilution. Immunohistochemical analysis of paraffin-embedded Human ovarian carcinoma tissue labeling MMP2 with ab97779 at 1/500 dilution. 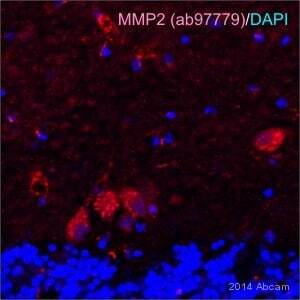 MMP2 was immunoprecipitated from U-87 MG (glioblastoma-astrocytoma epithelial cell line) whole cell extracts with 5 µg ab97779. 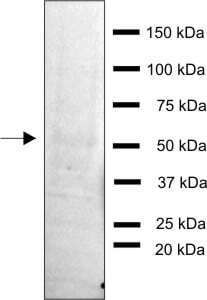 Western blot was performed from the immunoprecipitate using ab97779. Lane 1: Control IgG IP in U-87 MG whole cell extracts. Lane 2: ab97779 IP in U-87 MG whole cell extracts. Publishing research using ab97779? Please let us know so that we can cite the reference in this datasheet.